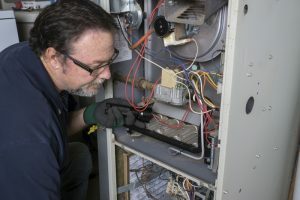 Our short response to this is going to be, “tune-ups are vital to ensuring that your gas furnace doesn’t become dangerous.” Keep reading to learn more. Truth be told, maintenance tune-ups are one of the most important furnace services in Lawrenceville you can get. Now, if a gas furnace posed a health threat to your home in general, they wouldn’t be installed in so many throughout the country. And they are the most popular type of heating system. You can rest assured that current standards for gas-powered furnace manufacturers place an emphasis on maintaining safe operation. They’re designed with a number of safeguards in place, like a limit switch that prevents a furnace from overheating. But no piece of equipment or appliance that is powered by natural gas can ever be 100% problem-proof. And although you shouldn’t constantly worry about using your gas furnace during the winter, you should take the appropriate measures each fall to keep up your system’s safety record! The furnace problem that’s most likely to cause a safety concern is a crack in the heat exchangers. These are clam-shell shaped metal chambers in your furnace that heat up from combustion gas and then transfer that heat to the air passing through the furnace system. In other words, heat exchangers are responsible for actually heating your home. The exhaust gasses inside the heat exchangers are toxic. But, when the heating process goes as it should, the furnace vents those gasses away through a flue, and out of your home. But if cracks form in the heat exchangers, then the harmful gasses like carbon monoxide can escape as the metal chambers expand from the heat. Therefore, instead of getting dissipated outside, the gas will enter your indoor air and collect there. So how do these cracks happen? Well they typically only occur in furnaces that have been around for about 15 years, give or take. This is enough time for corrosion to set in from the chemical reaction of the metal of the heat exchanger and the combustion gases. We actually recommend replacing a furnace that has reached this age as not only is safety a concern, but also a furnace that old can’t possible perform as efficiently as a newer heater. The best way to prevent issues with your gas-powered furnace is with maintenance. If you didn’t have maintenance done this fall yet, it’s not too late! If you had it done in the last year, then you should be okay. It’s more important that you are consistent with your annual appointments than it is the time of year you have it done. And if you ever believe there’s a problem with your gas furnace, don’t hesitate to call our pros for help. Don’t attempt to repair your furnace on your own! It’s also not a good idea to trust this job to a general handyman or amateur. When it comes to gas powered systems, the technician working on it should be properly licensed and certified to work with gas lines, and should have adequate experience in doing so. For quality heating maintenance you can rely on, contact Wall Heating & Air Conditioning, Inc.